Hey, that tastes good! : It's spring! Hi. It's spring now. And I live in Connecticut now. Hooray! Moving was rough, but we're settling in now. Alex and I started our new jobs, and trying to get back in the swing of things. As part of starting over, we're going vegan for a month, and trying to be healthier. We've been eating too much meat and junk. Now that the kitchen is unpacked (mostly), I was able to cook again. Hooray! We had gone to Wholefoods, where they had a great local-seasonal produce section. We got ramps, spring onions, fresh garbanzo beans, and fiddleheads. Yum. I also found some gluten-free (and vegan!) gnocchi, for $4. I cooked everything together and made the most delicious dinner. Bring a pot of salted water to boil, and cook gnocchi 2-3 minutes. Drain and toss in a little olive oil, then sautee over medium heat until slightly browned on all sides. 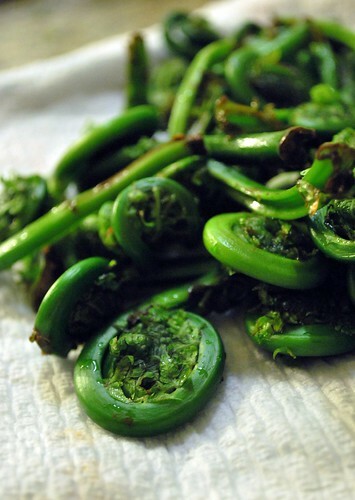 Meanwhile, steam the fiddleheads for 5-8 minutes, until fork tender. Slice the spring onions thinly, then the ramp bulbs, setting aside the onion tops and the ramp greens. Sautee the onions in a little olive for 5-10 minutes until softened and starting to brown. Add the mushrooms and cook until browned, then add the greens from the ramps and the onion tops. Cook until softened. Toss in the gnocchi, sprinkle with salt and pepper, and enjoy! I love fiddleheads although I pick my own locally. When my husband tried steaming them I thought they came out bitter. I usually boil them in chicken broth and then saute with melted butter and this year some wild onions we found growing with them. I have a recipe for gluten free butternut squash gnocchi. Easy to make a large batch and freeze for later use. Are ramps not the most delicious thing? I did some deep fried in a beer batter this week (the first deep fried food of the year, so it's okay :)). There's a festival in Elkins, WV, where they grind them into hamburger and cook burgers. They're a bizarre shade of booger green but oh, are they good! GF Vegan Gnocchi?! You are so lucky! Fiddleheads, too? Wow... jealous! GF and Vegan Gnocchi, cool! Did you find this at WF? Tried the Sunshine burgers you posted on last week. They are so good! What do you think of fiddleheads flavor-wise? I've always been underwhelmed, but maybe I didn't make them to their best effect. And welcome to CT! Don't know if you're anywhere near Fairfield, CT, but there's a really good natural supermarket called Mrs. Green's that has a fair amount of gluten-free stuff and really good prepared foods. I am also very concerned about your 'gluten-free' tagging of this post. 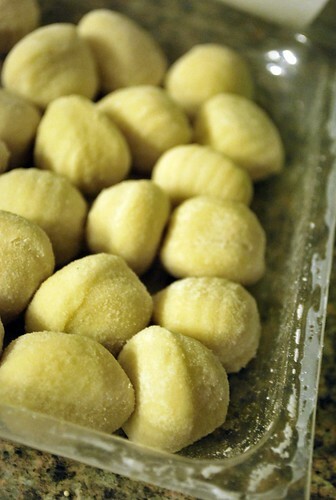 Gnocchi, though made with potato are rolled in flour. It is possibel to make GF gnocchi, but I have never seen a packaged version. What brand did you use? I have never seen GF gnocchi! How interesting. I still wish to make my own, but this packaged version would probably be great in a time when you're busy! Love how fresh this all looks. You know I've never had a fiddlehead? Never even seen one. Must be a Northern thing, LOL! They are pretty though! Thanks for the link, I've never seen Nuovo before, I'll definitely be on the lookout! I grew up in CT - enjoy! I understand your concern, however this is a totally gluten free blog. There is a link, both in the comments and in the post to more info about the gluten-free gnocchi that I used here. The brand is Nuovo, they are carried in wholefoods and gluten-free. Glad to see you back and that your move was a successful one. I got the gf gnocchi and they were awesome! We sprinkled fresh just a little fresh grated parmesan cheese over them and it was heaven! Also served gf cheesecake for dessert so it was a good night! Thanks for sharing and helping to make our dinner fantastic and gluten free! The sunshine burgers are fantastic and a must have now! 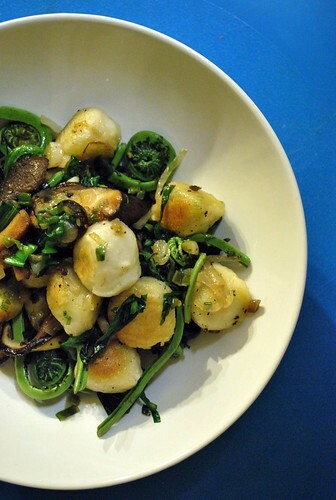 I have never had fiddleheads, but have always wanted to try them! This looks delicious! Good luck on the unpacking! Lovely post! 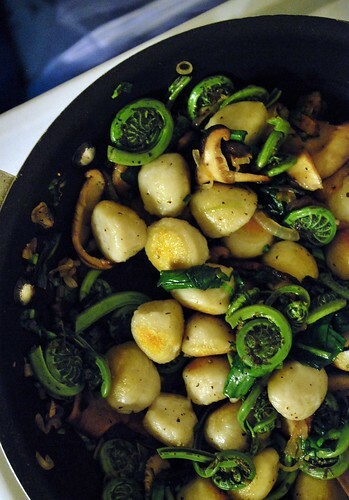 I love the gnocchi and the fiddlehead ferns. Hey! I'd love to send you a press release! Our bakery is now selling Gluten Free Cupcakes in Ohio. We also ship Nationwide.